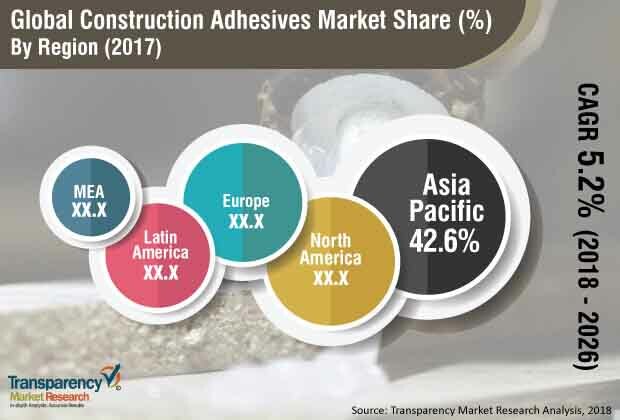 The global construction adhesives market was valued at US$ 9,202.3 Mn in 2017 and is anticipated to reach US$ 14,615.6 Mn in 2026, expanding at a CAGR of 5.2% from 2018 to 2026, according to a new report titled ‘Construction Adhesives Market: Global Industry Analysis, Size, Share, Growth, Trends, and Forecast, 2018–2026,’ published by Transparency Market Research (TMR). The global construction adhesives market is driven by the increase in demand for construction adhesives in residential housing and infrastructure industries. Asia Pacific dominates the global market, driven by the significant economic progress and infrastructure development in various countries in the region. The residential and non-residential construction sectors in the U.S. expanded significantly in 2017. This trend is likely to continue during the forecast period. The residential construction sector in the U.S. experienced year-on-year growth of 10.52% and 10.58% in 2016 and 2017, respectively. The non-residential construction sector expanded by 7.71% from 2015 to 2016. Major growth was witnessed in health care, commercial, and office buildings in the country. The housing market in the U.S. is estimated to expand at a rapid pace in the near future. New York, Houston, Los Angeles, and Chicago are projected to represent 20% of total construction output in the U.S. by 2026. India is expected to overtake Japan and become the third leading construction market in the world by 2026. The U.K. is set to become the sixth leading construction market in the world. The country is anticipated to overtake Germany to become the leading construction market in Europe by 2026. The U.K. needs to build around 3.3 million houses over the next 15 years to meet the requirements of its growing population. The construction market in Spain is projected to expand significantly in Europe in the near future. However, growth of the construction market in Germany is projected to slow down substantially by 2026. Mexico is likely to overtake Brazil by 2030, becoming the leading construction market in Latin America during the forecast period. VOC emissions that occur during the use of construction adhesives pose serious threat to the environment. Several countries have set guidelines regarding the permissible limit for VOC emission during the usage of construction adhesives, especially solvent-based construction adhesives, in industries. Manufacturing operations are bound by rules and regulations with respect to evaluation, registration, storage, usage, handling, and transportation of certain substances and their emissions, effluents, and related wastes. Violation of such regulations can result in heavy penalties, leading to legal issues. This is expected to restrain the demand for construction adhesives. Most manufacturers are shifting from solvent-based construction adhesives to water-based adhesives. Rapid industrialization and urbanization has increased air pollution, which has affected the health of people across the globe. Several countries are facing pressure from domestic and international regulatory bodies to formulate regulations and principles regarding VOC control in order to curb air pollution. Air pollutants such as VOCs, particulate matter (PM), carbon monoxide (CO), oxides of nitrogen (NOx), and sulfur dioxide (SO2) cause serious hazards to agriculture and climate worldwide. VOCs cause major air pollution in urban and remote areas. Emission standards have been fixed for effective control of air pollution. These standards allow permissible limits that are formulated by organizations such as Central Pollution Control Board, Ministry of Environment & Forests, Bureau of Indian Standards (BIS), World Health Organization (WHO), and National Emissions Inventory (NEI). The NEI is a composite of data collected from various sources, including the industrial sector, EPA models, and numerous state and local agencies engaged in air quality management. Based on product, the global construction adhesives market has been segmented into polyurethane, acrylic, epoxy, polyvinyl acetate (PVA), and silicone. The acrylic segment dominates the global market. Acrylic-based construction adhesives are synthetic fibers made from polymer. They are utilized to manufacture diverse products, including textiles and home furnishings. Acrylic-based construction adhesives work well on a wide range of materials such as wood, metal, glass, and outdoor and waterproof items. They are moisture-resistant and can sustain drastic temperature and seasonal changes such as ultraviolet light and freezing conditions. It takes about 24 hours for an acrylic-based adhesive to completely adhere to a surface. Acrylic is resistant to solvents and chemicals, making it a useful product for the industrial sector. Acrylic construction adhesives are costlier than rubber adhesives. However, they offer adhesion for a longer period of time. The polyurethane segment of the construction adhesives market is expected to expand at a significantly high CAGR during the forecast period. Demand for polyurethane products is projected to increase in the near future due to their rapid curing rate, high bonding strength, and low formaldehyde emissions. They can replace high-cost acrylic-based products in similar applications. Polyurethane construction adhesives are chemically reactive formulations. They provide strong adhesion that is impact resistant. They also offer better low-temperature strength than any other adhesive. Based on formulation technology, the global construction adhesives market has been divided into solvent-based, water-based, hot-melt, and reactive. In terms of volume, the water-based segment dominated the construction adhesives market in 2017. Water-based construction adhesives are emulsions of adhesive chemicals, usually polymers, suspended in water. These are primarily derived from acrylic, poly vinyl acetate (PVA), ethyl vinyl acetate (EVA), and styrene butadiene polymers (SBC) chemistries. Water-based construction adhesives are generally utilized in packaging and printing industries, especially in removable applications. Solvent-based construction adhesives are solutions of adhesive chemicals or polymers in petroleum-based solvents. These adhesives can be employed in permanent as well as temporary applications. Most solvent-based construction adhesives emit VOCs during and after the application. In terms of application, the global construction adhesives market has been classified into structural and non-structural. The non-structural segment is projected to lead the construction adhesives market during the forecast period. These adhesives provide cost-effective solutions for assembling of finished products. Non-structural adhesives include contact adhesives, wherein a solution or emulsion containing an elastomeric adhesive is coated onto both adherents. The solvent is allowed to evaporate, and then the two adherents are brought into contact. Based on end-use, the global construction adhesives market has been segregated into residential, non-residential, and industrial. The residential segment accounted for major share of the construction adhesives market in 2017. Construction adhesives are used in numerous applications in the construction industry. These include flooring underlayment, ceramic tile laying, carpet laying, roofing, wall panels laying, and wall covering. Acrylic, epoxy, polyurethane, and silicone construction adhesives are employed in the residential sector. Water-based construction adhesives are preferred over solvent-based adhesives due to the absence of VOC emissions in the former. Based on region, the global construction adhesives market has been split into North America, Europe, Asia Pacific, Middle East & Africa, and Latin America. Asia Pacific dominates the global market, driven by the significant economic progress and infrastructure development in various countries in the region. Increase in building and construction activities is expected to boost the construction adhesives market in Asia Pacific. The global construction adhesives market is partly consolidated and is characterized by high degree of competition among market players. Currently, generic products are available in the market. This makes it easy for buyers to switch between products, leading to an increase in competition among players. Key companies operating in the global construction adhesives market include Henkel AG & Company KGaA, SIKA Group, 3M, Bostik SA, and H.B. Fuller Company. TMR’s data repository is continuously updated and revised by a team of research experts so that it always reflects the latest trends and information. With extensive research and analysis capabilities, Transparency Market Research employs rigorous primary and secondary research techniques to develop distinctive data sets and research Product for business reports.